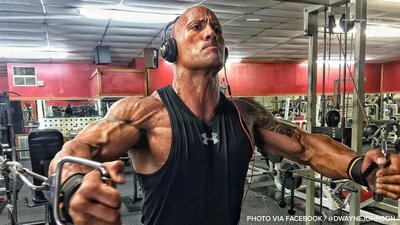 Rock Out: Here's The Rock's Workout Playlist! Dwayne Johnson has unveiled his soundtrack for WWE 2K18, and it's a perfect high-energy blend of beats, riffs, rhymes, and silliness that we'd love to lift to! If you're one of the 92 million and counting in Dwayne "The Rock" Johnson's crew (that's on Instagram alone), then you can just imagine the great one listening to these lyrics and gripping the iron a little bit harder. Maybe he's getting set for a heavy bench press, or prepping for leg day. The lyrics keep pounding. The reps keep piling up. You know you want to be there. Of course, this hip-hop banger is just one side of the playlist that Johnson released recently and announced on Instagram. There's also plenty of classic rock from the likes of Boston, Joe Walsh, and even the Blues Brothers. There's hip-hop royalty old and new, from NWA to Tech N9ne. Heck, there's even some lighthearted funky fun from Bruno Mars. The only unifying style? This is seriously high-energy music from a seriously high-energy guy. "My playlist below has some of my personal favorites to work out and get hyped to or if you just wanna be a cool BAMF, I got your back with these tracks," Johnson said in his post. If you want a pump between your ears, check out the complete playlist on Apple Music, or play it here.